9 is a full-length adaptation of Shane Acker's short film about nine rag dolls banding together to survive in a post-Apocalyptic world. 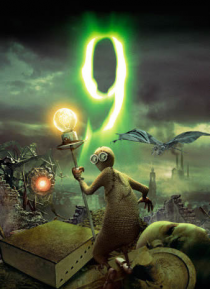 A thought-provoking and beautifully stirring bit of storytelling, 9 features an all star cast of voice talent that includes Elijah Wood, Jennifer Connelly and Martin Landau, as well as John C. Reilly, Christopher Plummer, and Crispin Glover. Tim Burton and Timor B… ekmambetov produce.